The tiny principality of Monaco, a sovereign state of just under one square mile, has an outsized resume, boasting some of the planet’s most expensive real estate, and the world’s most prestigious casino. Facing the sea, and engulfed on the other three sides by France, it has been the domain of the Grimaldi dynasty since the 14th century, and enjoys the same glamorous reputation as the rest of the Riviera. 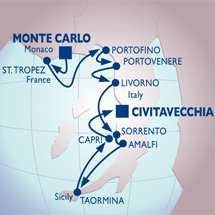 Cruise from Monaco to the Italian Riviera and Amalfi Coast before arriving Rome on this rivieras cruise to Italy’s west coast ports.